There’s a standard format for celebrating a mathematical milestone, perhaps the 80th birthday of some deeply eminent number theorist. His collaborators and graduate students, and their graduate students, and their graduate students all gather together in some gorgeous location to regale each other with their latest theorems, while the rest of the world pays no attention. For the London Mathematical Society’s birthday, we had something different. Well, we did have the gorgeous location. The Goldsmiths’ hall in London is a magnificent venue, and the livery hall in particular was evidently designed by someone with a peculiar fondness for Element 79. (See for yourself.) But speaker-wise, a decision had obviously been taken that the party would be an outward-looking affair. 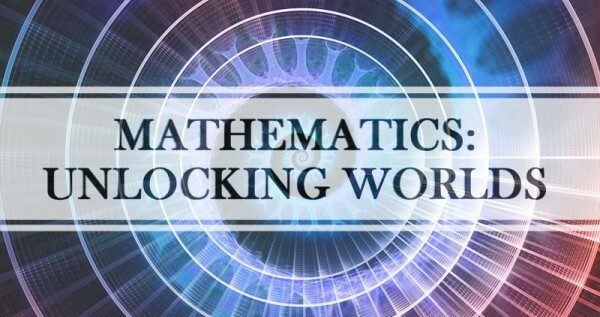 The focus was not so much on the LMS, or even on maths per se, but on our subject’s ability to unlock worlds, particularly the worlds of TV, film, and computer games. Behold! Further evidence that maths is a thing which popular entertainment can be based on, and not the terrifying subject of horror and difficulty that its stereotype would suggest. Not only do we have a maths-based TV gameshow (now in its second series), and even a maths-based cop drama, but maths is also the topic of a UK-touring comedy show, performed by Aperiodical homie Matt Parker. We sent Dave Hughes, of the Leeds MathsJam, along as a scout to one of Matt’s recent performances, and here’s what he thought of the show. If you never thought maths could be made funny, you’ve never seen any of Matt Parker’s shows. Matt’s latest Number Ninja show takes a whirlwind trip through the everyday uses of mathematics in an accessible and fun way. His friendly and approachable personality invites audience participation pretty much all the way through with demonstrations of concepts which may have been previously shrouded in mystery. This show debunks a number of mathematical myths and shows the audience that maths is not to be feared. You will go away from this show with much to think and talk about. Just how much of everyday life is really down to coincidence? Ever wondered how barcodes work? 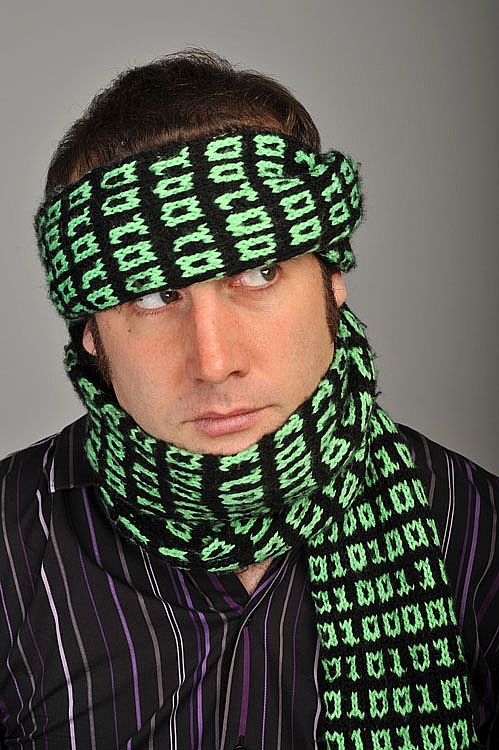 Who did knit that scarf for Matt? All these questions and more are answered here – it’s designed to be appealing to all – you don’t have to be a complete number-brain to enjoy it! There are still a couple of dates left on the tour, in Havant (Hampshire) and Barnstaple (Devon). For more details, visit www.standupmaths.com. If you can’t catch him on this run, Matt also does regular shows in London and occasionally tours as part of the excellent Festival of the Spoken Nerd. We’re all back from the big MathsJam weekend. We’ve got loads of material which we’ll start putting up once we’ve recovered our energies. Meanwhile, Colin Beveridge has sent in his report of the event. Last weekend – as I’m sure all Aperiodical readers know – was the MathsJam annual gathering in Cheshire. Now, I’ve always hated conferences. Loathed the bloody things. I resented travelling to them, resented preparing talks, resented the uncomfortable beds, the politics, the enforced niceness. I resented the nod-along-and-pretend-you-understand, the gabble-away-with-your-head-down-so-you-can-say-you-gave-a-talk, the questions-for-the-sake-of-advancing-pet-theories, the sessions that lasted weeks. I resented the trying-to-find-veggie-food-in-New-Orleans, the being-expected-to-show-up-for-everything, the having-to-keep-receipts, all of it. I could have just stayed at my desk and played Tetris. But MathsJam is different. Science Showoff is a monthly night which takes place in a pub in London, and features acts from all areas of science, who each have 9 minutes to perform an act – a science demo, a routine, songs, experiments – anything entertaining or fun. Having tried a little bit of the short-set, trying-to-be-funny type of science communication involved in Bright Club (a similar venture, giving researchers the chance to try stand-up comedy, which started in London and has now spread all over the country), I thought it would be good to give it another go – in fact, Science Showoff was recommended to me by someone who saw my Bright Club set in Manchester. I had prepared an 8-minute piece about Fibonacci numbers to perform in Manchester, inspired by my artist friend’s admission that she didn’t see how maths could be interesting in the same way as art; she wasn’t there to watch, but I went down well (and ran horribly over time). So I decided to reprise my set at Science Showoff in February 2012 – and this time it would be the right length, and would be new and improved with all the best jokes left in and the duds taken out.